This 5.5-inch Android handset with laser autofocus launched in India back in August and this month reaches the US starting at $199 USD. Asus ZenFone 2 Laser has been available in India since early August, and this month the US market will get it as well. The handset has been released at the ZenFestival, and its main highlight is the 13 MP PixelMaster camera with f/2.0 wide aperture lens and laser autofocus. 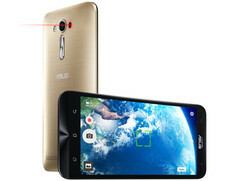 According to Asus, the main camera of the ZenFone 2 Laser can focus in less than 0.3 seconds while the dual LED real tone flash makes it ideal for shooting in low-light conditions. Asus ZenFone 2 Laser will cost $199 USD (16 GB variant) or $249 USD (32 GB variant) and will go on sale via the Asus Store and Newegg. We will get back to it as soon as it becomes available for purchase, so stay tuned.